Expandable VoIP PBX for medium businesses, with additional features. Xorcom XE2000 is an integrated VoIP PBX, based on Asterisk®. Xorcom XE2000 is suitable for medium businesses and is designed in such a way that can be expanded as your business expands and your needs grow. 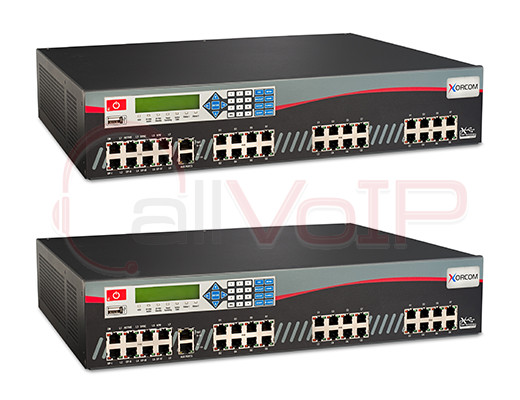 In can be expanded to support up to 160 PSTN lines, 40 ISDN BRI lines, 17 ISDN PRI lines and 300 users, just by adding FXS, FXO, ISDN BRI or ISDN PRI modules, without upgrading the base unit. Xorcom XE2000 supports SIP and H.323 phones, and it can easily be expanded to (through the options at the bottom of this page) to support analog and ISDN phones, as well as fax machines. Xorcom XE2000 supports up to 50 simultaneous calls, has 2 hard disks in RAID-1 configuration, redundant fans, integrated full backup system, and an LCD with integrated keypad on the front panel. Hard disk: 2 x 250 GB 2.5"